Ibrox Noise: "Unsettled" - has Stevie got this key call correct? "Unsettled" - has Stevie got this key call correct? 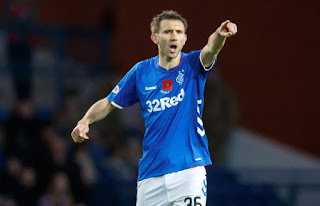 Despite our piece earlier discussing the latest reason why Nikola Katic is not featuring as heavily as he did, it nevertheless doesn’t alter the curiosity of Rangers’ defensive structure. As fans know, for the first month or two it was a settled back four of Tavernier, Goldson, Katic and (mostly) Flanagan – but this changed as Halliday started to feature more at LB as well as Katic’s demotion to the bench for Joe Worrall’s introduction. A back four which had looked so settled seemed now to be disrupted and a few points did seem to get dropped as well. Connor Goldson had some health issues, Gareth McAuley wasn’t fit, Joe Worrall wasn’t popular with anyone bar the manager, and Katic’s form struggled on reintroduction. Meanwhile James Tavernier was doing pretty well but, as mentioned, his opposite flank saw constant flux with Halliday, Flanagan and Borna Barisic seemingly taking turns till the latter got injured with his country. And now we look at the defence and the word ‘settled’ definitely doesn’t seem to apply – yet it’s keeping more clean sheets than not and withholding much more than about a goal in any domestic match – indeed it’s worth pointing out, incredibly, that only Motherwell have scored more than one goal against Rangers aside Villarreal and Spartak this entire season. So, it’s certainly not the case that this unsettled back four is actually leaking goals. But we do wonder if Gerrard will plump for a first-pick backline or continue the rotation. It seems, presently, fitness notwithstanding, that James Tavernier, Gareth McAuley, Connor Goldson and Borna Barisic are Rangers’ first-choice defence, but unless the Croat is ready for Thursday or indeed this weekend’s trip to Tynecastle, it’s likely to be Andy Halliday again (Lee Wallace remains available, Stevie). Which leaves us wondering about rotation and its merits. Let’s face it, regardless of who’s played, Rangers have been conceding very, very few goals the past month or so. Whether it’s Worrall or Katic, Goldson or McAuley, the clean sheets have been regular and no one scores more than a goal a time against us. Obviously the great Allan McGregor helps here too, but despite Goldson and Halliday’s slightly below-par displays last weekend, nevertheless it was a valuable clean sheet for Rangers. Katic or McAuley, whatever Gerrard is doing with this fluctuating defence, by and large seems to be working. Just 11 SPL goals conceded in 13 matches is not bad at all – and three of them were that messy Motherwell disaster. Can’t really complain, can we? Come on Stevie ...He Deserves Another Go! I'm happy with the rotation of the squad everyone gets game time. But if Stevie G gets it wrong when we play the manky mob and it's Forrest who has ran amok down that right hand side a want him sacked. He can get away with it on other teams rotating and getting results or dropping points but I ain't accepting it when it comes to them from the East End of the city. We just won't put up with that. Maybe I'm asking for to much to soon but we are the famous Glasgow Rangers.